It’s not healthy, and it’s not (usually) organic. But it’s easy. And I like easy, because I am not good at cooking. Pizza is definitely not something I would want to eat every day. But on the weekends, or after a day when I spent too much time trying to clean my house, sometimes I cheat on dinner. And there’s no easier way to cheat on dinner than to throw a frozen pizza in the oven. Because then in twenty minutes of no work, you can have a meal that everyone in your family will eat. 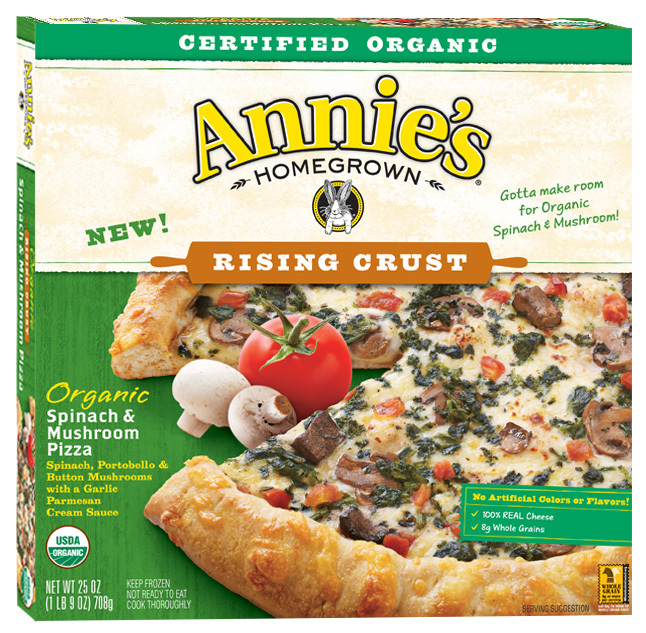 So when I was invited to review Annie’s organic pizza by Green Moms Meet, I was excited. Because I love making healthier versions of not-so-healthy food. Healthier food where someone else did all the work for me? Even better. I got a coupon for one pizza, but I bought a second pizza as well. At 11.5″, Annie’s pizza is bigger than the frozen pizzas I usually get (from Trader Joe’s), but it’s still not as big as, say Papa John’s. And, well, our family can eat a lot of pizza. 1. I could pronounce almost all the ingredients. Mind, I said almost. It’s hard to get packaged food with no weird ingredients–they generally need some preservatives. The crust has carrageenan (whatever that is) and xantham gum (which I can kind of pronounce, but it’s not something I keep in my kitchen). But vast majority of ingredients are things that I have in my kitchen, like wheat flour, palm oil, and familiar seasonings. 2. Everyone in my family liked it. I liked the spinach pizza best, which had a lot of spinach–and fresh tomatoes, too–and actually made me feel like I was eating vegetables. Anastasia, of course, liked the pepperoni. But she actually ate it, which is more than I can say for most dinners. 3. The crust was thick and soft. Generally we get thin-crust pizzas, which have less bread and more of whatever is on the pizza, but sometimes it’s nice to have a thick crust pizza. And for frozen pizza, these turn out well, with surprisingly soft crusts. Would I consider this a super healthy dinner? No. But when it comes to cooking, I’m all about balancing healthy with easy stuff my kid will eat. This is a good compromise. And–you can win one! I’m giving coupons for free Annie’s pizza to THREE readers. Just comment on this post to enter! Follow Annie on Facebook for more coupon and giveaways! Congratulations to April Sterba, Jessie C., and Rachel Q (commenters #1, 2, and 5), the winners of the giveaway! Winners were chosen using random numbers generated by Random.org. Oh heck yeah! I need a less guilty alternative to Digiorno with a side of baby carrots. Ok, I’ll bite. We’d love free pizza. We are going through a kitchen re-model. Today, I have no sink. This would totally help me avoid dirty dishes. Thanks for offering! I <3 pizza. I don't have to be a mom to enter your giveaway, do I? Would love to try Annie’s Pizza.